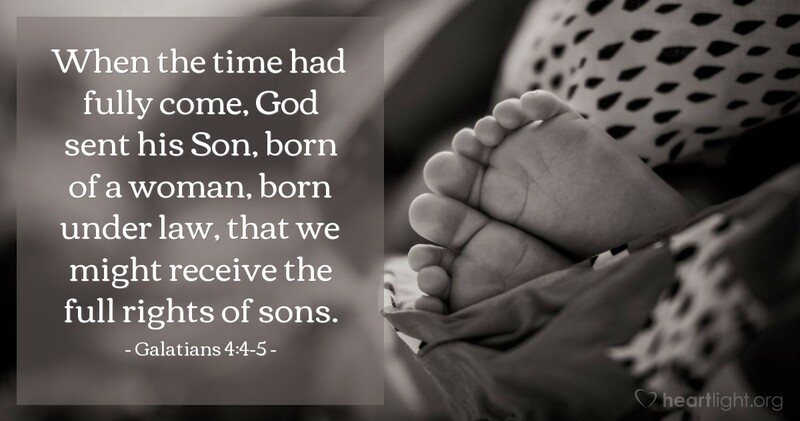 When the time had fully come, God sent his Son, born of a woman, born under law, that we might receive the full rights of sons. God waited till history reached his appointed time and sent Jesus. Just the right time — Roman rule, Jewish subordination, good roads, freedom, a degree of safety, a common trading language, cruel and barbaric punishment accompanied by religious infighting. In times such as these, he sent his Son to be a woman's son. He emptied his home so he could send a redeemer to our home. He did it so we could be his children — not pretend children, but real children, with full rights. So he could not only be God, but so he could be Abba. Abba Father, even your name is precious to me. I gasp at how much it cost you to let me call you Abba. I don't understand such extravagant love, but I thank you for it. I know I don't deserve to call you Abba, but it sounds so right. Something inside resonates at the sound of Abba — Holy, Righteous, Almighty, Abba! While I know that I will never be a perfect child, I rest today in the confidence that I am your child and you claim me. Thank you in Jesus' name. Amen.